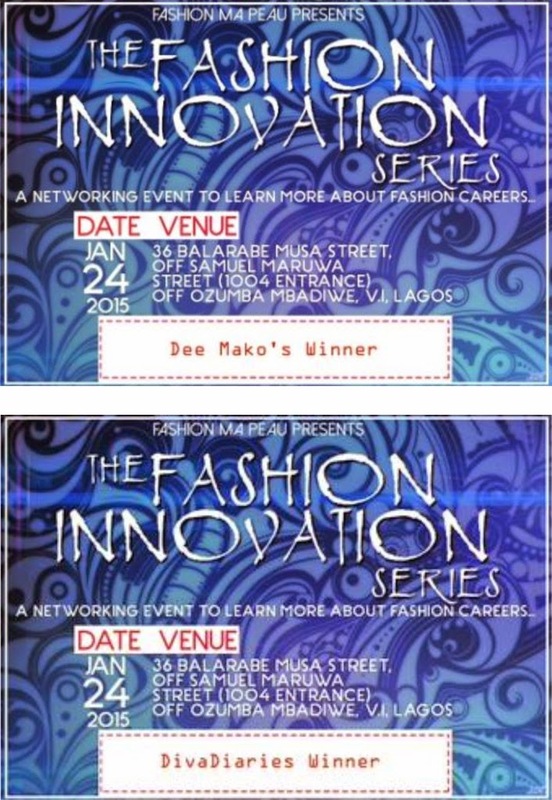 A while back I attended the fashion innovation series and I had a blast. It was enlightening and in all was a nice event. I won two tickets courtesy divadiari.blogspot.com and deemako.comI finally got to met Desola of deemako.com and Velma Williams of infashionrehab.com. A quick observation these ladies were very nice and friendly. Unfortunately, I couldn’t take any pictures because I took the wrong battery for my camera but I have decided to share some of the things I learnt with you. 1: African time is still in existence, so be patient. My friend and I got to the event a little late at about 12:30 PM and we were so worried that the event had started and we missed a lot but surprisingly people hadn’t arrived. Due to that the programme started really late. 2: Blogging is a community. When I started my blog, I knew bloggers through their blogs but now it’s as though we are a community. Every time I meet a blogger, its like I’m meeting an old friend. 3: I have anonymous readers. I really have to learn how to deal with that, it was an awkward moment for me when a lady said ‘hey, damiesdiary’ ok pause anyone who knows me personally will call me just ‘damie’ So I smiled said ‘hi’ and she started a conversation of how she reads my blog and never drops comments. I was glad and. Joyed sha, thank you. 4: Every fashion career is important. I dint say this earlier the event was aimed at creating opportunity for fashion creative to network and talk about their careers. I became more aware of the importance of each fashion career, the set backs and possible achievements. 5: I should step out of my comfort zone: I got to meet an old long friend from junior school (can you imagine?) and like I said I met other bloggers and fashion creative which wouldn’t have happened of I was chilling in my bed. I definitely look forward to events like this and can’t wait for the next season of the fashion innovation series. 6: your blog is your portfolio : I was chatting with a lady at the event and she asked why I was there then I told her I was a blogger. Glam she asked for my blog link, its amazing how people always have Internet for things like this and immediately logged on and the first thing she said was ‘beautiful blog’ you need to see my smile ‘cos I knew that it was a very honest opinion coming from a complete stranger. So your blog does speak a lot about you. It was a great experience in all and I am of course glad I got to attend. alentines day scrap that presidential election?